The Sussex keeper has not played any cricket since July 2014 because of a recurring Achilles tendon injury. "I was expecting to be fit for the 2015 season," Prior said. "Unfortunately, this has proved impossible, and I have now had to reach this decision." He added: "I feel honoured to have played for Sussex and England as many times as I have and shared so many great times with both teams. I also feel privileged to have been involved in an era of such success for English cricket. "I have always tried to play with pride and passion and have a deep belief that the team will always come first. Although I haven't achieved all the goals I had set out to, I feel immensely proud of what I have done in my career. Sadly it is now time to move on." The South African-born right-hander was named England's player of the year in 2013 after saving the final Test and series against New Zealand by batting for four-and-a-half hours on his way to an unbeaten century. By that time, he had been appointed vice-captain and attempted to win a fourth Ashes series in Australia in 2013-14. But his form dipped - he made only one fifty in eight Tests - and was dropped for the final two Tests of the 5-0 whitewash in Australia. Despite his bludgeoning batting style, Prior could not replicate his Test form in one-day internationals, averaging 24.18 runs in 68 matches. In December 2014, he co-founded the new professional One Pro Cycling team, saying cycling was a "huge passion". The wicketkeeper made his debut for Sussex - the only county he represented - in 2001. During his time at Hove, Sussex won three County Championships, three domestic one-day titles and the Twenty20 Cup. In November 2004 he was selected to tour Zimbabwe with England's one-day squad. On the 2010-11 tour of Australia, he claimed 23 catches in the series, including an Ashes-record-equalling six in the first innings at Melbourne. He made 271 runs at a 67.75 average during England's 4-0 series win against India in 2011. 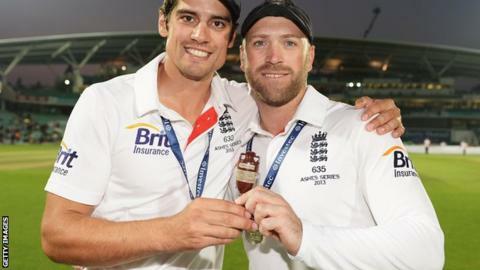 Former England batsman Kevin Pietersen, who criticised Prior in his autobiography: "We may have had our differences, but I'd like to wish Matt Prior all the best for his future... we did play some v good cricket together!" Former England women's captain Clare Connor: "Be very proud Matt Prior - you've played professional cricket with the same huge smile, heart & soul as when I first met you aged 10!" Sussex cricket manager Mark Robinson told BBC Sussex: "He stands up as one of the best wicketkeeper-batsmen, in terms of his own personal stats and what he won. Matt finished international cricket and was going to play for us for a bit, so you feel a bit cheated. He still wants to be a part of the club, which is great news for us." England batsman Ian Bell: "Congrats Matt Prior on a great career. Was a pleasure playing with you bud. Wish you all the best in the future endeavours!" Prior's former teammate, Stuart Broad, told BBC Radio 5 live's In Short programme that he was "the heartbeat of the fielding team."